Last weekend, I went out on a photo date with Madison, and came home swooning. 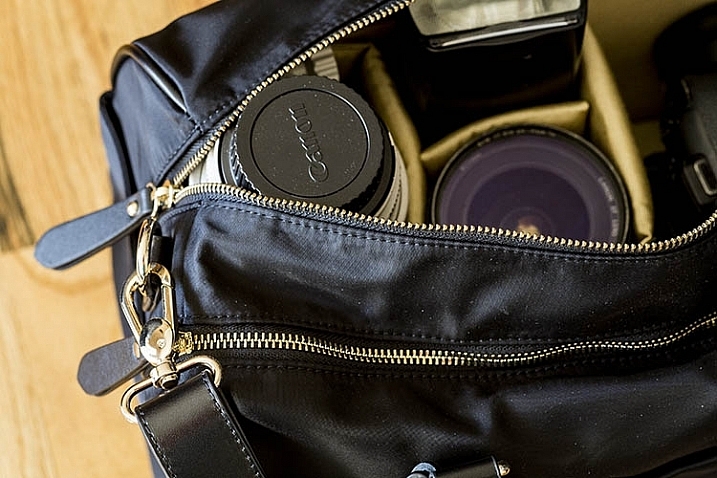 In a world where camera bags largely take the form of backpacks, shoulder sling bags, and messenger bags, finding a vessel to transport camera gear is notoriously difficult for women who would rather carry something that appears more feminine. 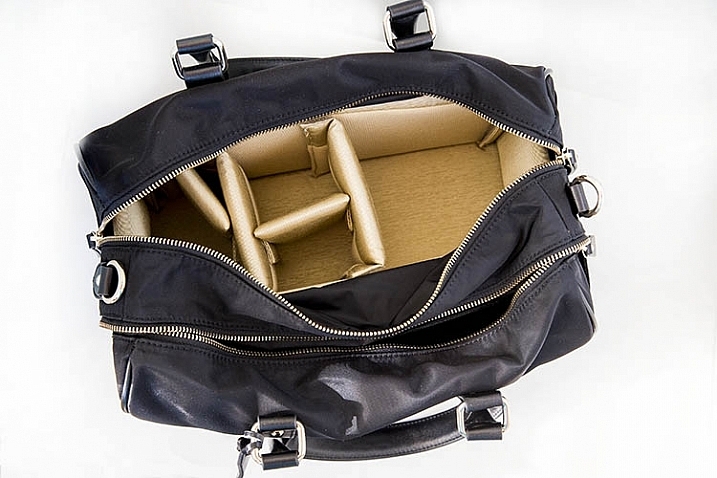 That is the problem identified by Michele Ng, a former marketing executive who founded Aide de Camp with the intent of producing attractive camera bags for busy and active women. 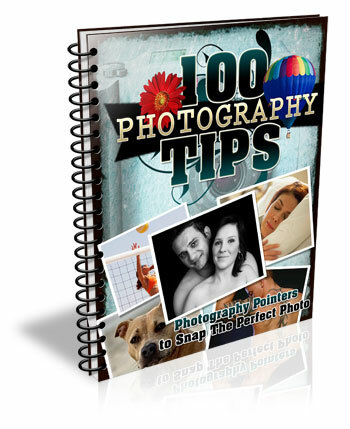 The result is a collection of bags that, on the surface, resemble purses or totes that a woman would be proud to flaunt on her shoulder, yet on the inside are padded and structured to keep expensive camera gear safe. 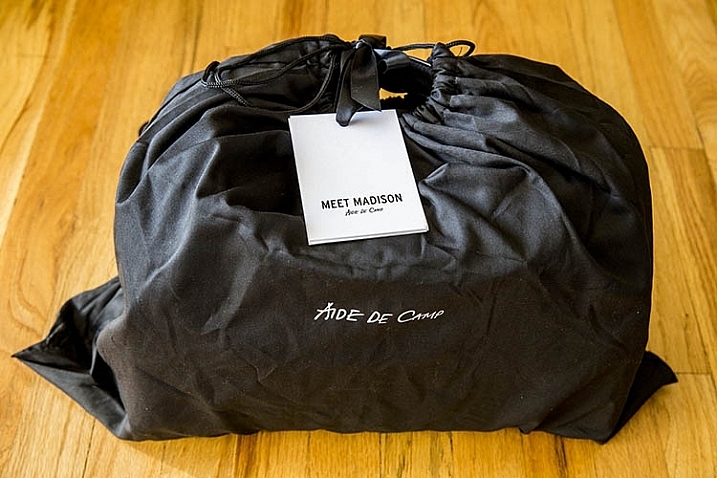 I took Madison, one of Aide de Camp’s flagship bags, on a test run and was very pleasantly surprised with the results. Aide de Camp’s products impress from the moment you open their packaging. Instead of the distinctly unstylish cardboard and bubble wrapped items we’ve come to expect from most other retailers, the Madison camera bag arrived at my doorstep in a sturdy black cardboard box and black fabric pouch, both totally solid enough to reuse in other ways. It was like unwrapping a Christmas present, and it set the tone for the pretty, yet functional, product inside. Madison’s approximate dimensions are 14.5″W x 8.5″H x 8″D, making it a pretty sizable shoulder bag, as pictured below with a Canon 70-200mm f/2.8 in the frame as a reference to its size. The bag has two main compartments; one with a thickly padded, removable camera insert box, and the other with thinner compartments for holding everyday items such as a wallet, tablet, e-reader, etc. The spacious, easily accessible, secondary pocket was a definite perk as many other camera bags seem to add extra pockets as an afterthought, making them impossibly thin and difficult to access. Also, the removable insert is sold on its own item on Aide de Camp’s website, making it easy to convert just about any spacious bag into a camera bag. 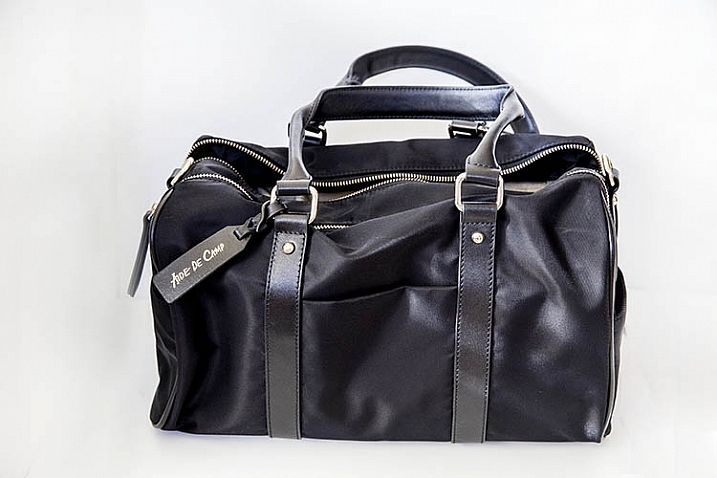 Given the fact that Madison, and most Aide de Camp bags, come with a removable camera insert, this bag could easily double as a weekend or overnight bag. Given Madison’s ample size, it should come as no surprise that you can pack almost all of your essential camera gear in this bag. The bag’s website promised that both mirrorless camera systems and small DSLR cameras could fit, yet I was amazed when even my larger Canon 5D Mark III with a 50mm f/1.4 lens attached was able to comfortably sit in Madison’s camera insert box without feeling too cramped. I was also able to put a Canon 580 EXII flash, a Canon 16-35mm f/2.8, and Canon 70-200mm f/2.8 lens in the camera section of the bag and zip it up without too much of a hassle, although the telephoto lens was just barely able to fit. Even with the camera section fully maxed out, the secondary pocket was still pretty spacious and I could easily slip a tablet, e-reader, and other essential items in with no problem. After unwrapping Madison, I was struck by how solidly built the bag was, while at the same time maintaining a sleek, rich appearance. Madison’s exterior is composed of water-resistant lightweight nylon along with genuine leather handles and trim, and 14-karat gold plated zippers. The bag itself has two short 9″ long handles, but it also comes with an optional cross body strap that is adjustable from 34-53 inches in length. 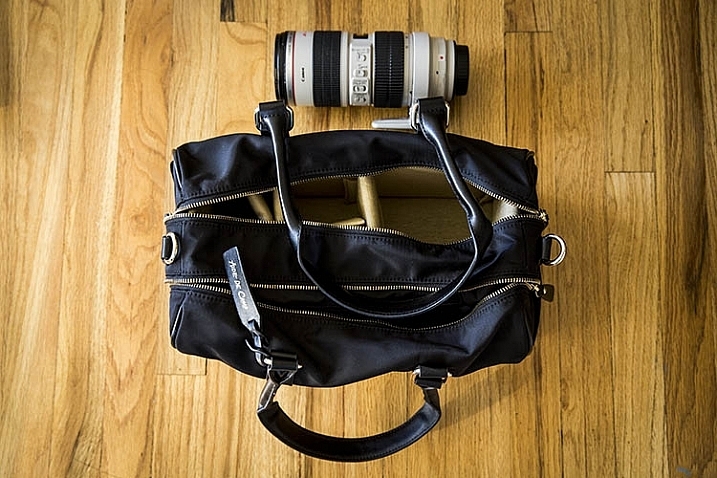 For all of Madison’s fashionable and practical features, there is one glaring detail that is hard to notice: the bag’s straps are not padded, making it not very ergonomic if you were to pack the bag with heavy camera gear. In that sense, it’s wise to follow Aide de Camp’s recommendation and only put mirrorless or compact DSLR camera gear in this bag if you plan to carry it for a long time. Do you think there’s a demand for camera bags that appear more feminine and fashionable? If so, would you give Madison a try? Have you tried other similar brands? What did you think? 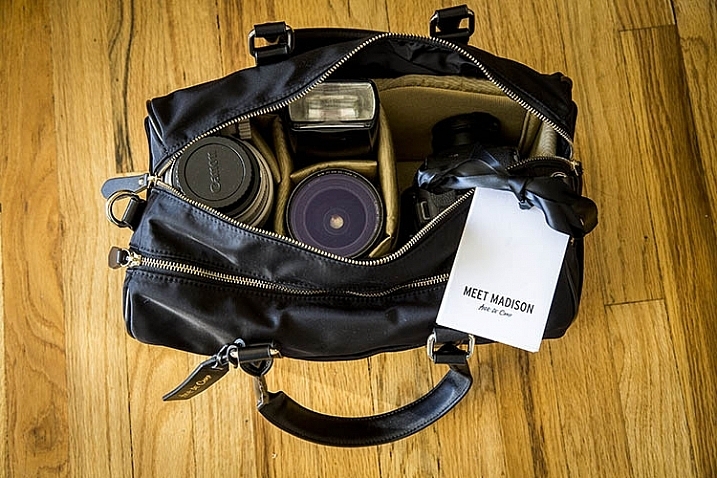 The post For Women Photographers: Review of the Madison Camera Bag by Aide de Camp by Suzi Pratt appeared first on Digital Photography School.